Notepad - Looking For Trouble? Look no further. 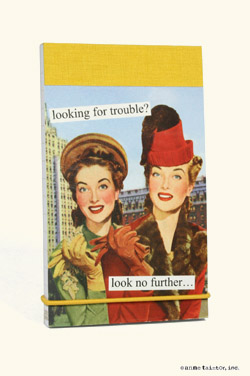 . .
Home > Paper Goods & Office Supplies > Pocket Notebooks & Notepads > Notepad - Looking For Trouble? Look no further. . .
Talk about a wise shopping decision! Color-coordinated elastics hold the 68 lined pages of our nifty Mini Notes neatly in place in pocket or purse. 3"w x 5"h.